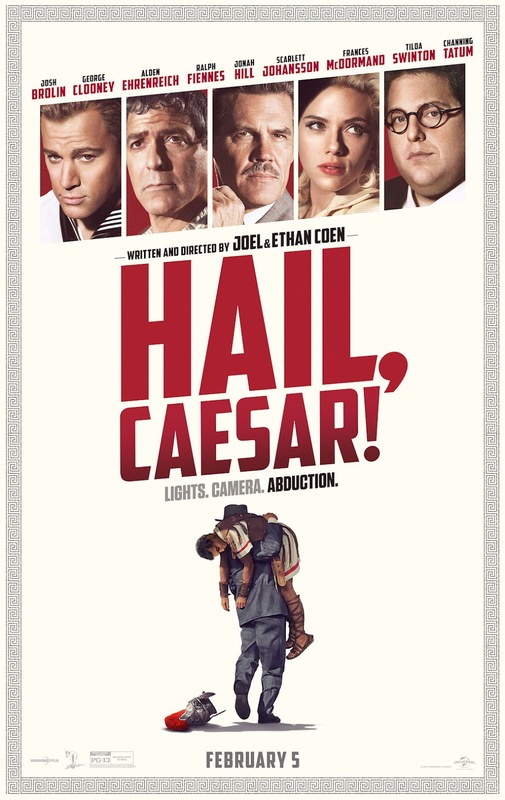 The Michigan Movie Guy: Hail, Caesar! "The truth, yes. Hmm!" That hilarious yet mysterious quote from Josh Brolin is one of many quotable lines in Hail, Caesar!, a very good, albeit minor effort from the Coen brothers. Brolin plays Eddie Mannix, a studio head for Capitol Pictures in the 1950's. He is also a "fixer" who tries to keep his stars out of trouble. At the moment, Capitol Pictures is working on their biggest film of the year, Hail, Caesar! : A Tale of the Christ, starring big-name actor Baird Whitlock (played by George Clooney). All of a sudden, one day, Whitlock does not appear on set, & is revealed to have been kidnapped by "The Future", a group of Communist screenwriters who have been blacklisted, who are holding him for $100,000 in ransom. While trying to secretly get the money, some other things occur. B-movie western actor Hobie Doyle (played by Alden Ehrenreich) is being transferred from a western to a period drama directed by Laurence Laurentz (played by Ralph Fiennes), which causes some problems between the two due to Doyle's inability to correctly say one line. Also, Mannix has to deal with non-stop questions from competing twin gossip columnists Thora & Thessaly Thacker (both played by Tilda Swinton), who, besides asking Mannix questions about Whitlock's disappearance, also ask about the truth about how Whitlock managed to get the lead role in the notorious film, On Wings of Eagles (which after the title is said, a distant eagle cawing sound is heard). Meanwhile, aqua-musical actress DeeAnna Moran (played by Scarlett Johansson) becomes pregnant during production of the new aqua-musical. Fearing a major public relations fallout, Mannix works out a deal with surety agent Joseph Silverman (played by Jonah Hill) to "foster" Moran's child for a few days for her to "adopt" from him. And on top of all this, Mannix is mulling over an offer from aviation company Lockheed to become a major executive. The film is very good, even though it does falter at some points. The acting was really good, with the entire cast all giving great performances. The direction, screenplay, & editing from the Coen brothers are great, proving once again that they are two of the greatest directors in film history. Overall, this is the best Coen brothers comedy since 2009's A Serious Man.